“The more we feed our mind with anything in one direction, the more it will wander there. Let us feed our mind with good spiritual food and have it wander in the right direction” (Pastor Charles T. Russell, “What Pastor Russell Said,” page 159). There is a saying “the grass is always greener on the other side.” It is like this with our natural dispositions—that whatever is “a little piece off” from us we are inclined to want, perhaps like a cow in a paddock who is fed the best grass in her own barn, but when beside the neighbour’s fence, she will try to break through the fence to get to the neighbour’s paddock of grass! But what happens then?! Let the following picture and the Scriptural admonitions on it do the explaining! Dear friends, we want to fence ourselves off from the world that we will no longer desire those things, and as the Apostle says, “set our affection on things above and not on things beneath” (Colossians 3:2). This word “set” suggests a continual setting. Set it today, and tomorrow morning set it early, and if it slips off, set it back again. If it slips off set it back again, and by and by we will be too busy to have time to wander. Let us not become overcharged with the affairs of this life by very trifling things, things that are not worthy of our attention at all, but foolishness. Let us not give our mind to what another person imagines and made a story about, such as secular entertainment often is. In the Bible we have the most wonderful story, the most wonderful drama that was ever known. The Bible could be said to have the best plot that any novel ever had or will have. It goes all the way back to the beginning of Creation and shows the garden of Eden in all its beauty and grandeur, then the coming in of the serpent and the temptation of our first parents. Mother Eve was deceived and father Adam, being perplexed, gave his very life for his wife, because he thought he could never live without her. Thus he proceeded against God’s command. He ate fruit from the tree of the knowledge of good and evil in the midst of the Garden of Eden (Genesis 2:9, 17). This river of Eden may represent the “river of water of life” that flows from the throne of God to bless mankind (Revelation 22:1). That river of life is the Gospel, or good news, of salvation through Christ. The life and work of Christ comes to us in four Gospel Accounts, that may be represented by the four headwaters contributing to the river of Eden. The Pishon river that flowed around the whole land of Havilah, where there is gold (Genesis 2:11) reflects the Amram Levites, who were situated on the eastern side of the Tabernacle and may represent the antitypical “Little Flock” and BRIDE OF CHRIST. The Gihon river reflects the Merari Levites who were situated on the northern side of the tabernacle who “burst forth” in service to the Heavenly Father. The Gihon river flows through south-eastern Mesopotamia into Ethiopia – which from time immemorial has been a symbol of servitude so would represent the SERVANTS class before the throne in heaven, the palm-bearers of Revelation who were also of the spirit-begotten class and “called out of Babylon” class—the “great multitude” class. These do not qualify as the Bride of Christ yet are a heavenly class “before the throne” (Revelation 7:15) who “burst forth” with joy in serving the Heavenly Father and The Christ—head and body, who shall then be complete in full glory. The Tigris (Hidekel) River means “rapid” and it may reflect the Kohathite Levites who represent the Ancient Worthies who will be the “princes on earth” helping humanity make rapid progress by their work on earth to “rapidly” spread the Truth about righteousness and the need to obey God’s law of love in order to inherit eternal life. The Euphrates River – reflects the world of mankind in the kingdom as reflected in the typical picture of the Gershom Levites on the Western side of the Tabernacle arrangement of Israel in the wilderness, who shall be fruitful in the 1000-year Millennium as they walk up the “highway of holiness” to gain eternal life choosing obedience to Godly principles. Then we learn about what disastrous effects of sin have come into the world as the result of Adamic disobedience. We could not have any deeper plot than to think how the Adversary and the fallen angels have conspired to blind and delude men and women from Eden to now. The picture then reveals our great Creator looking down from His holy habitation, beholding our condition in sin and degradation, hearing the groaning of the prisoners, all going down to the prison house of death. Can we find any novel more engaging than that? Only God can help man out of his trouble. No power but God’s can open the bars of the prison‑house of death and bring the prisoners out. Only by choosing to obey God will life eternal, and eternal happiness, result. God’s eye pitied us, and He extended his Arm to help us, in the person of his son, Jesus, who as our redeemer gave his life a RANSOM FOR ALL. Jesus Christ died the just for the unjust and thus satisfies justice. When the proper time comes for the Millennial Reign of Christ with his Bride class, then mankind will be released from the curse. This will occur, by God’s grace, after the sharers in the anti-typical “sin offering” shall have fulfilled their covenant of sacrifice until death and become the completed Bride of Christ united with their Head, Christ Jesus. Thereafter, the living among mankind who embrace the Kingdom can begin walking up the Highway of Holiness, without passing through the death experience. For the curse will be abated. Subsequently, those raised from the dead will also be invited to walk up that Highway to perfection, if they will (Isaiah chapter 35). This grand novel provides still more! What kind of Bride will the Heavenly Father have his Son to possess? She has only the filthy rags of sin and imperfection, yet she desires to be in harmony with God’s will. So Christ, her Bridegroom, provides for her purification, cleansing, and justification. He even provides her a wedding garment. Is this not a great plot? Now, what must the Bride do? She must receive this robe of Christ’s righteousness which is to be the wedding garment. A marriage is preparing, and the bride must get ready by getting a robe from the bridegroom. Then what shall the Bride do with this robe? She must embroider it. She gets the robe for nothing and has the stamped pattern given to her. Christ is the pattern and she must do the embroidery work herself. She must work out her own salvation “with fear and trembling” (Philippians 2:12), seeing carefully that every stitch on the robe shall conform to the pattern the Lord has given her. What does the embroidery represent? It represents the fruits and graces of the holy Spirit. We know that unless we have those fruits and graces, we will never be counted worthy to be a joint‑heir in the Kingdom. What are the fruits and graces of the holy Spirit? “The fruit of the Spirit is love, joy, peace, patience, kindness, goodness, faithfulness, gentleness, self‑control; against such things there is no law” (Galatians 5:22‑23). How long does it take to embroider these? It takes longer with some and shorter with others. Some can get their hearts fixed on this glorious pattern (Hebrews 12:2) and so appreciate it that it is the great desire of their lives to cultivate these graces of the holy Spirit. As they go to the Lord, the first thing in the morning they say, Lord help me to cultivate the fruits of Thy spirit today. Because I want to be pleasing to the Bridegroom, and be ready when he claims his Bride, that I may be counted worthy to enter in as a member of that Bride class (2 Thessalonians 1:4-5). Then all the trials and difficulties we are obliged to pass through, will be finished. He allows us to be tempted in all points like He was tempted. “14 Since then we have a great high priest who has passed through the heavens, Jesus, the Son of God, let us hold fast our confession. 15 For we do not have a high priest who is unable to sympathize with our weaknesses, but one who in every respect has been tempted as we are, yet without sin. 16 Let us then with confidence draw near to the throne of grace, that we may receive mercy and find grace to help in time of need” (Hebrews 4:14-16). Because He wants to have a Bride class who can endure temptation, endure hardness, show loyalty, and manifest that they are not merely so‑so Christians, but really overcomers, seeking to know and to do God’s will. He wants them to love righteousness and truth so that they would lay down their lives in this service, rather than receive the pleasures of sin for a time. He has taken nearly 2000 years so far, for this purpose. God knew there would not be very many who would love Christ sufficiently to lay down their life in sacrifice with Christ, in difficult circumstances, and thus receive the reward of incorruption and immortality with Christ. Every one of the Bride members will be approved of the Father. Christ will present them blameless and unreprovable before God in love, after they have had all of the necessary trials that permit their share in the blessings (which come from the sufferings for righteousness sake) of Christ. Christ invites whom he will, and marks them with the holy Spirit of God. This mark indicates who has been invited to run in the race “toward the mark for the prize of the high calling of God in Christ Jesus” (Philippians 3:14). They are called out of Babylon (Revelation 18:4) and enlisted in a “beauty contest,” like Queen Esther. It is a beauty contest pertaining to one’s Christlikeness. The criteria are based upon a character of godliness and righteous conduct, reflecting loyalty, trustworthiness, and obedience to God’s will. The overcomers will constitute a loyal Bride of Christ forever. This “calling out” or “marking” with the holy Spirit of God allows them to understand His Divine plan and character. This is part of the betrothal process. We are engaged to Christ now and everything depends upon our developing proper Christian character, upon wearing our robe, and upon showing our love and zeal by the embroidering our robe with the fruits and graces of the spirit. Then comes the marriage of the Lamb when the Bride has made herself ready. What is the marriage all about between Christ and His “little flock”? The marriage will be our collective union with the Lord. How will it be brought about? By the change from imperfect human nature to Divine nature—“changed in a moment, in the twinkling of an eye” (1 Corinthians 15:52). Then we are to be forever with the Lord. And is there a supper, or something? Yes, or we might call it a breakfast, as it is in the morning. The word “supper” comes from the terms “to sup.” You may sup in the morning, noon or evening. It means to eat. This supper is to be the first great banquet that we will have on the other side of the vail. Who could ever imagine that such a most wonderful drama is found in the Bible? Well, before the supper begins they will wait a little while for the Bridesmaids, comprising a secondary company. They were part of the church at one time; they made a consecration and were begotten of the holy Spirit, just the same as the Bride class, but they failed to make their calling and election sure to the high position to which they were invited. They were not sufficiently zealous and loyal. Oh, No! No disloyal ones will be given anything at God’s hands. By and by they will come up through great tribulation and wash their robes and make them white in the blood of the Lamb, and be before the throne instead of on the throne. They will have palms of victory instead of crowns of glory. So we read in Psalms that after Jesus, the King, shall introduce the Bride before the Father, then the virgins, her companions that followed after her, shall also be brought into the presence of the King (Psalms 45:14). Oh, there is a grand drama there in all that Bible picture! Then have we anything more? Yes, the King and Queen are going to reign for a thousand years, and everybody is going to be blessed. In all that empire there will be no attempt to take from the people their rights, and make everything subservient to the King, and the people poor. The very reverse of this. The King will take delight in lifting the people up, refreshing them, and bringing them to perfection. Then, by the end of the thousand years, when all the unfit ones are destroyed from amongst the people, all of these grand beings will show forth the praises of God. Astronomers tell us that numerous stars are suns like our sun, with planets around them as the planets around our own sun. Are these worlds yet to be inhabited? If God formed the earth to be inhabited, might other planets someday be inhabited? We think so. Then who is to do that great work? God says that Christ shall be first in all things, so that will put Him first in that great work. Who will come next in God’s arrangement? The Lord says that the church shall be next to him. Now we have Christ and the Church and a great work for them for all eternity in peopling millions of worlds. Can anyone make a greater drama than this? My heart rejoices and overflows with gratitude to God for the privilege now of having a chance to become an heir of God and a joint‑heir with Jesus Christ, my Savior. We have all been called in one hope of our calling (Ephesians 4:4), and this is the hope of our calling. Is it sufficiently grand for you? Do you know of any other kind of business in which you could become so rich as that? The Scriptures are indeed right when they tell us about the riches of God’s grace, and when Jesus tells us of the pearl of great price, it is a valuable pearl indeed. If any man once gets his eyes on it, and appreciates the value of our heavenly calling, then let him dispose of everything he has in order to win that prize. So let us do, dear friends. Br. Charles Russell. The content of the above post is based on the written content of Br. Charles Russell in “What Pastor Russell Said” (page 159), titled “CONSECRATION‑Proper Use of Time,” Question 158:1 (1913), Should Christians spend their time reading worldly magazines and newspapers? How To Study The Bible And Have It Make Sense. Can you follow my footsteps through trial and pain? And dwell like a pilgrim and stranger on the earth. Despising earth’s riches, and living to bless? Can you ask from your heart the forgiveness of men? Can you list to reproaches, nor answer again? Who have watched for your falling, who have set for you snares? Though you come on the waves of a storm-crested sea? From the home of your childhood, the friends of your heart? Afar from their love — can ye lie down and die? And bear your reproach, your disciples to be. Of grace you has promised abundant supply. How Can we Handle Our Sufferings in Christ, in a Jesus Way? Let us begin with a zap of JOY … that Jesus kind of joy that a child of God can feel from the words of Hebrews 12:11, which provide great reassurance that any painful experience allowed by God (which may include the pain endured from the sufferings in Christ), will actually NOT HARM the New Creature in Christ begotten within us, but rather, it will work out something wonderfully beneficial to the Old Mind (i.e. it will destroy it even more) and to the New Mind it will actually be a stepping stone to maturity and growth in Christ. Do we suffer for preaching about Christ’s Gospel? Are we ridiculed at work for speaking up for the Truth? Perhaps we have lost our job because of it? Do we fear standing up for Jesus? Do we fear being ridiculed by what others think of our interpretation of Bible Scriptures, hence we remain the quiet ones to keep in a comfort zone? Are we embarrassed to be seen by all as Christ’s representatives? Are we laughed at and labelled as “crazy” or “brainwashed” or “unbalanced” when we speak of the Gospel of Christ? Or perhaps we are labelled by names from our past failures which we later recognized, grew from and changed our course of behaviour? Do we fear being passionate about the Truth because of feeling we won’t cope when told we are going overboard or that we spend too much time on studying the Bible? Do we too, not experience attacks from the Adversary? Do we not all experience the works of ignorance. Because of our imperfections of the flesh, we are not able to perfectly understand nor perfectly be understood. Would you all not agree, that if we could read the hearts of each other, much unkind judgment would be prevented. Since we cannot read the heart, it is good to err on the side of love between our brethren and pray (even more perhaps than use words) about the details which only the Heavenly Father perfectly understand and will never distort. God is the perfect judge as we are not perfect yet in the full sense of the word “perfect;” only “reckoned” as righteous through Christ’s robe of imputed righteousness (Romans 4:22, 23). Often the scripture is quoted “you will recognize them by their fruit” (Matthew 7:16), but have you experienced a situation where we in all sincerity of heart, give a testimony about the Gospel of Christ, yet it would seem that one, perhaps in an ecclesia meeting cannot see the fruits of God’s character in us and we are told to stop speaking? 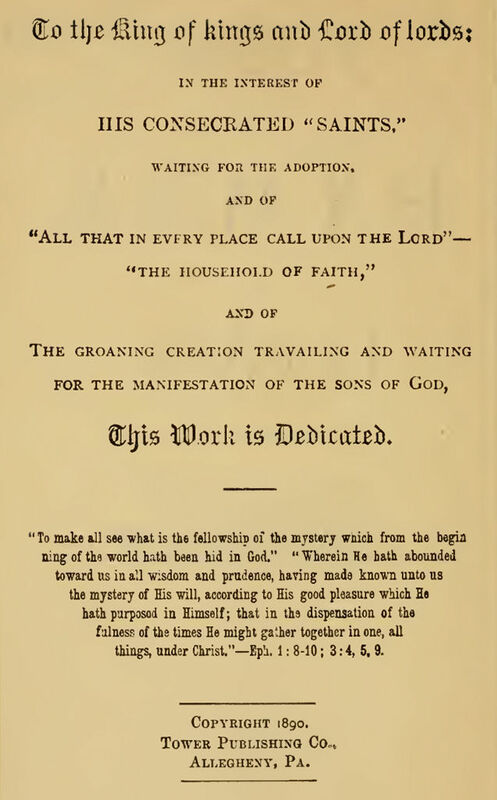 If we prayerfully and patiently endure with a sincere purity of heart intention, in seeking for righteous communication and to share the joys of the gospel, then GOD OPENS A DOOR OF BLESSINGS TOO NUMEROUS TO COUNT, (even if the flesh does experience sufferings for righteousness sake) from which the new mind in Christ rejoices in, thanking the Heavenly Father for each test of our faith, obedience and loyalty to Him. Let us not think that the comments of others are to intentionally harm us. It is good to remember that WE HAVE ALL SINNED (Romans 3:23) and to remove first the plank in our own eyes before we try to remove it in our brothers. “If we say we have no sin, we deceive ourselves, and the truth is not in us” (1 John 1:8). “Surely there is not a righteous man on earth who does good and never sins” (Ecclesiastes 7:20). If we feel wronged by our brother’s words, let us not retaliate with words of defense, but after taking it to our Heavenly Father in prayer, silently watch our Heavenly Father work things out PERFECTLY, praying for their victory and ours, in Christ—since we each have professed to belong ONLY to Christ, and wish ONLY THE BEST towards all our brethren in Christ, knowing that each of our beloved brethren struggle in their own unique ways to more than overcome the flesh, the world, and the adversary. GOD is our best defender who can read the hearts of all, and allows each experience to work out perfectly what He so desires, in us. The apostle Paul encourages our thoughts to be on “whatever is TRUE, whatever is HONORABLE, whatever is JUST, whatever is PURE, whatever is LOVELY, whatever is COMMENDABLE, on that which is EXCELLENT and on anything WORTHY OF PRAISE” (Philippians 4:8). The above verse is a wonderfully perfect tool to remember using to clean out our minds from any negative thoughts! In Titus 1:15,16 we are given a description of such. “Unto the pure all things are pure; but unto them that are defiled and unfaithful is nothing pure; but both their mind and conscience are defiled. They profess to have known God, but by their works they renounce Him, being abominable and disobedient, and to every good work worthless” (Titus 1:15,16). The “pure” can see the true, pure hearts of God’s sincere “little ones,” in spite of the weaknesses of the fallen flesh. They can see righteousness in the Divine law and arrangement. While “the defiled” may identify with the cause of God, but whose doctrines and manner of life are in conflict with the gospel because they are fault-finders and unbelieving — “and unfaithful” (Diaglott). Can we ever fall into a fault-finder category and be labelled as unfaithful too? We sure can, IF our consciences become perverted, where we end up being unable to see anything or anybody in a proper light. This leads to losing the spirit of love which thinketh no evil! “They could find fault with everything–nobody could do anything just right, no doctrines were right. We have all met people of this character—people who see nothing pure, nothing good, anywhere, and who are denouncing others all the time and this is how their consciences become defiled. At first the conscience of such would to some extent reprove them. But gradually, if they yield to this wrong heart attitude, their consciences become corrupt and hardened, so that they do not realize that they are prevaricating, misjudging, do not see how unjust, impure and blind they have become. “They profess to have known God,” says the Apostle—knowing something in an intellectual way about His Plan and Word—”but by their works they deny Him.” Their works are contrary to God’s Word, which instructs that all should seek to do all the good they can, to see all the good they can, and to give generous judgment to others. The Apostle is not saying here that such have necessarily become immoral and vile in that they have become delvers into all kinds of sin and vice. We are not to read into his words anything that is not there. But he does say that so far as any good work is concerned they will defile it, injure it. Better would it be that they keep away from the Lord’s work entirely. They have allowed the bitter spirit to work in them until everything takes on the color of their own minds. They do not recognize to what an extent they are unjust, unrighteous, in their thoughts, their words, their conduct. They are injurious to every good work. The above words by Pastor Charles Russell are truly a GREAT WAKE UP CALL to every true Christian. They are humbling thoughts and truths to apply to each of us as we ALL fall into the trap at one time or another with thoughts that should rather be positive towards all our brethren in Christ, but which the flesh often prefers to ignore. “Let the elders who rule well be considered worthy of double honor, especially those who labour in preaching and teaching” (1 Timothy 5:17). 2. Focus on the Christ-like qualities we see in our brethren, just like we would wish others to focus on the Christ-likeness they see in us (Philippians 2:3; 4:8). 3. Listen. Jesus also remained silent when Pilate questioned him (Matthew 26:63). 4. Continually ask God for His help (Psalm 121). 5. Wait for God. Trust in God to deliver and bring justice (Exodus 14:14; 2 Chronicles 20:17). 6. If God inspires the conscience to do so, reply using gentle, kind words (Isaiah 30:21). “Speak evil of no one, to avoid quarreling, to be gentle, and to show perfect courtesy toward all people” (Titus 3:2). This statement shows not only our appreciation for our fellow brethren in Christ communicating their best interests for our highest spiritual welfare, it also reflects our faith in God’s power through prayer as well our joy and gratefulness in the sacrificial offerings of our fellow yoke-bearers in Christ, keeping them also in our fervent prayer (1 Peter 3:17). 7. Let us ask ourselves what would bring our Heavenly Father grandest JOY? What words and what actions would best represent our Head–the Captain of our Salvation? (Hebrews 12:2). “Love your neighbour as yourself” (Mark 12:31). “Think of others as better than yourself” (Philippians 2:3). “Pray for those who persecute you” (Matthew 5:44). 9. Consider our Brethren in Christ as are “our joy”, “our crown” and “our hope” as did the apostle Paul (1 Thessalonians 2:19). 10. Realize our own shortcomings (Matthew 7:1-5), and copy the forgiveness that our Lord, Jesus Christ had towards all (Ephesians 4:32). We “ALL fall short of the glory of God” (Romans 3:23). May we rest in the assurance that if we do our very best to keep a pure conscience before God and seek to only do what is righteous and pure and loving and just, GOD will deliver us in due time. It is far better to boast about one’s own weaknesses (2 Corinthians 11:30) and make the strengths in our brethren shine out gloriously if in their presence. With kind and gentle words, prayers, patience and even at times silence towards those who may attack us for Truth sake, let our confidence be in our trust in the LORD’s strength which HE DOES gives us, and let us defend the Truth where it warrants this, just like Christ Jesus did. May we not let our hearts turn bitter or cold. “A soft [gentle] answer turns away wrath, but a harsh word stirs up anger” (Proverbs 15:1). The fallen angels know if they cannot harm us by using those in the world, they surely will try to plant discord amongst our closest within the Church. Our prayers for each other is so important. Having agape love towards all our brethren in Christ is necessary to be of the body of Christ. Our Lord Jesus is the best example of this, laying down his life as a ransom for ALL; being crucified by the ignorant actions of his very own (John 1:11). We all need encouragement from each other. Be a Daniel. Dare to stand alone. Dare to start a project and finish it which would be spiritually edifying those who have a listening ear to the Word of God. All for Jesus! The time is short! The more tests that are overcome now, the grander the shine! To become the shiniest diamonds in character then the tests of character development in Christ are to be passed in often unfavourable conditions for the flesh. The members of the high calling are in training to be kings and priests who belong to their head—Christ Jesus, and they will help the world of mankind up the highway of holiness so each lesson learned now and each experience that is overcome now, is a lesson that will be most beneficial for the future. May our presence have a most pleasantly refreshing, calm, soothing effect on all in Christ who would be in our midst so that Jesus’ presence may be what is felt by all. Since Christ suffered for us (1 Peter 2:18-25), the saints are also exhorted to suffer and accept trials with the same spirit as did Jesus. Our Lord, who committed no sin, was in all respects perfectly holy. He was entirely innocent and suffered without having committed any crime. As Jesus suffered unjustly, his body members should regard it as being no strange thing when they too undergo similar sufferings and persecutions. The scriptures tell us that there was no guile, deceit, hypocrisy or insincerity found in Jesus’ mouth, for he was in all respects what he professed to be. Though he was condemned as an impostor, that charge was wholly untrue. Jesus was reviled and spoken of as a deceiver, charged with being in league with Beelzebub, “the prince of devils,” and accused as a blasphemer against God (Luke 11:15). Although he was falsely accused by his malefactors, Jesus did not revile those who reproached him. Jesus seldom used harsh language and showed no anger. He calmly stood and bore it all, for he came to endure all kinds of sufferings in order that he might set an example for us and make an atonement for our sins. Such should be our course as well when faced with similar attacks. The words in 1 Peter 2:25, “Ye were as sheep going astray,” alludes us to the words in Isaiah 53:6, “All we like sheep have gone astray; we have turned everyone to his own way; and the LORD hath laid on him the iniquity of us all.” This thought in a broader sense expresses the condition of the human race before God recovers them through the plan of salvation. A flock wandering without a shepherd or guide is in a pathetic condition, and so was it for the prospective body of Christ before being sought out and brought into the true fold by accepting the value of the shed blood of the Good Shepherd. In 1 Peter 4:12-17, the apostle warned his readers about the coming of a more intense period of persecution, stressing the importance of patience and mental readiness. Peter intimates that the Church should not regard it as being strange or unusual for the people of God to suffer as did Christ, because later they will be glorified together with him in God’s coming kingdom. He also admonishes the Church not to become perturbed concerning matters unrelated to Christ, but to rejoice in their afflictions, knowing they will be counted as a blessing. The people of God should always place their lives completely in God’s hand, believing that because God is their Creator, He will be their preserver. God withholds no good thing from those who love Him and walk uprightly. He who is employed in God’s service will always have God’s protection.